LHR-HND-Sydney? & Return. Appreciate JAL wont allow one-way. Noticed that LHR-HND-Auckland may not work as it probably isn't a published fare? desperately trying to figure whether I've got the game yet? ROFL. I have flown SYD-NRT-LHR on JL/BA as a one-way award with no problems (except the BA fuel surcharge). AAdvantage no longer permits free stopovers on any of its awards; if you want a stopover, you would have to redeem for an additional award. The two awards combined will usually cost more miles than a single award. But there are some oddities in the AAdvantage award chart where a single AAA-BBB-CCC award with no stopover actually costs more miles than separate AAA-BBB and BBB-CCC awards! If you are redeeming AA miles on a partner carrier (like JL), the fact that the partner carrier's FFP does not offer one-way awards is irrelevant: If you are redeeming AA miles, you can redeem for one-way awards on AA or any of its partners. Do you have any examples there of 2 x singles working out better? Business Class SA2 to North America is 57.5K miles. Such an award does not even permit a connection in SA1. 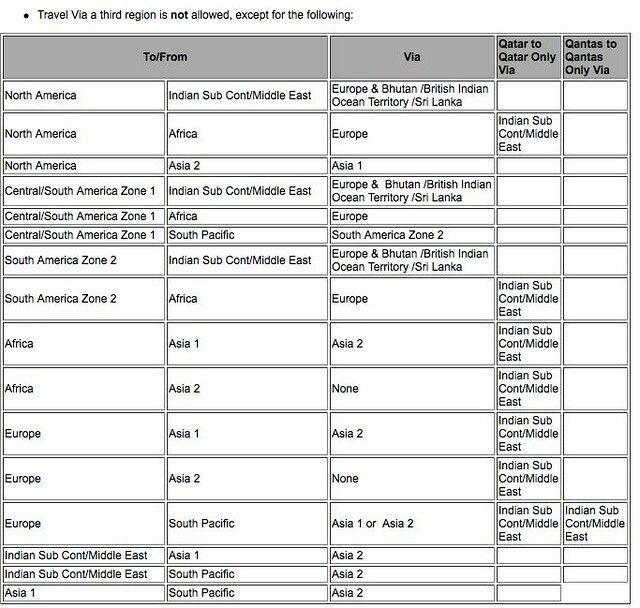 But Business Class SA2 to SA1 is 25K miles; and SA1 to North America is 30K miles, so a total of 55K miles -- with either a connection or a stopover in SA1. Going in from the home page will default to AA flights. If you go to the 'plan travel' tab, then 'flights' and select 'all carriers' you'll get BA. I'm getting plenty of BA flights showing up TATL for example. I understand that Etihad from Australia to Europe (e.g. LHR) will be priced as 2 awards, but only one award (married segment) with Qantas. Q: what about Qatar - say MEL to DOH then to LHR? One or two awards? Another Q: AA was showing SYD to HND with QF then HND to LHR with BA, but when I tried to book, it threw me out saying flights no longer available! Phantom? Yes, Australia to LHR via DOH QR-QR is one award (without a stop, of course). And yes, almost certainly phantom availability. American has had this issue with QF seats for many months and it's very frustrating. I'm in contact with someone at AA's technical department about this. If you would like to post or PM me the dates I will provide it to them as further proof. LHR-HND-SYD on BA/QF should definitely be ok. I've done LHR-NRT-BNE before on BA/QF. If you can wade through the phantom availability at aa.com it's bookable. BA's full fares between LHR-SYD are MPM based. You can connect to QF/JL/CX/MH pretty much anywhere in Asia 1 or Asia 2. Most likely is due to phantom QF availability than anything else. Exactly. The routing is legit but the QF phantom availability is extremely frustrating. It is a real time wasting, futile effort. Thanks, danger, for confirming that Australia to LHR via DOH on QR-QR is one award. You are absolutely correct, as I have just finished booked an award flight for hubby - he goes back to Oz each year to visit his mother in a nursing home. We have been looking at sale fares but they always black out the period from around 15th December to 10th January. The one way itin for hubby at the end of December is syd doh cdg lhr (the last one with BA) for 115K aa miles in F (club euro with BA) plus taxes around £120. Hubby was happy with this outcome as it would require more miles with EY. Before booking the above, we saw on aa website syd hnd with QF then hnd lhr with BA but nothing stuck when I tried to book online. The dates were around 29th to 31st December. If you search those dates for syd to lhr, you will find the flights I mentioned. There were also flights with QF and BA via PEK and PVG, but they required an overnight stay so we scrapped them. Thanks, Dave Noble. A bit annoying that AA showed flights that were phantom. I did check the segment by segment for availability in QF and BA, and you are correct - it was QF phantom. Hope you can make some progress on this with AA. On the other side of the spectrum but equally frustrating is, AA does not show AY and AB availability when BA shows plenty of availability - and they are NOT phantom because I can proceed to book on BA site, as well as AA phone agent could see it when I wanted to change date. Yet on AA site it only showed one or two days but BA showed literally everyday on both J and Y for intra-eu flight from HEL.